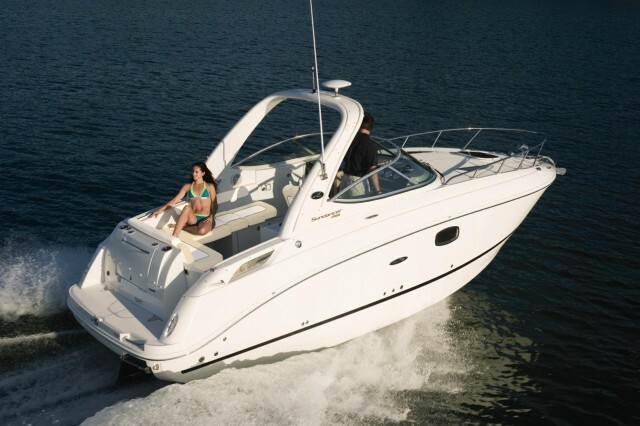 2006 Sea Ray 250 Select Executive BR (26’6” X 8’6”), MerCruiser 6.2L MPI 320 HP Bravo 3, ’07 Marine Master Tandem axle welded tube custom trailer with all disc brakes. This boat has 2 tone gelcoat graphics in Arctic White & Cinnabar. 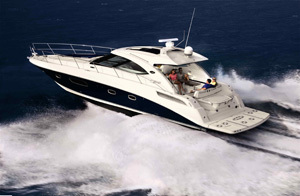 The cockpit floorplan has (2) large bucket seats with flip up thigh rise bolsters, STBD side Wet bar with AFT wrap around L-Lounge with central walk thru passage and flip out filler cushion to form A full sunpad. Helm features include a Navman Tracker 5500 GPS Chartplotter, SmartCraft Digital Instrumentation, Compass, STBD Wiper, Hydraulic trim tabs, Corsa Quick and Quiet Exhaust system, docking Lights, tilt wheel with vessel control and in dash remote control for the Clarion AM/FM/CD/AUX IN/Sirius Ready “Premiere” stereo with Polk Momo speakers, AMP and Subwoofer. 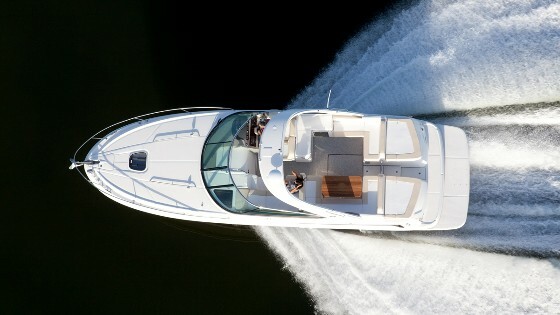 Cockpit features include snap in carpet liner, Cockpit table with 2nd base in bow, underfloor Ski/Wakeboard storage, aft walk thru filler cushion and backrest, SST Cupholders, courtesy lights and an enclosed bathroom with potti inside the passenger side dash. 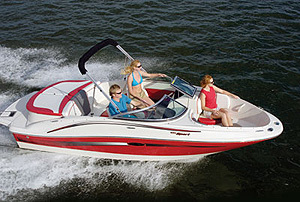 Other features include Bow filler cushions, bow block off door, bow speakers, bow anchor locker, dual battery system with switch, freshwater System with sink and transom shower, SST ski tow eye, SST props, SST swim ladder, Sunbrella Bimini shade top with Full running enclosure, snap down cockpit and bow covers plus a full running enclosure, snap down cockpit and bow Covers plus a full custom fit IBC road cover. 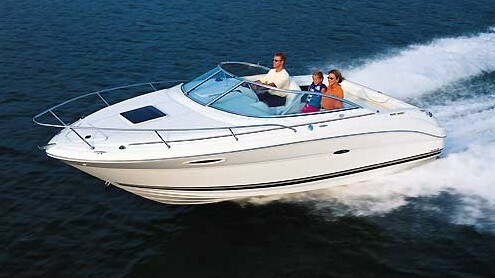 This is a one owner boat sold here new with only 526 engine hours use.